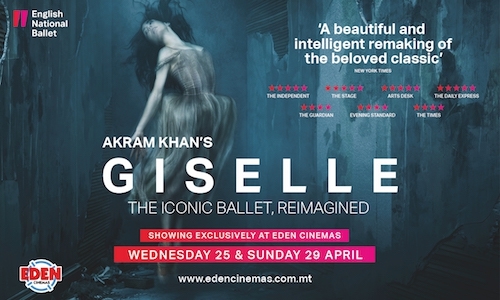 Hailed as a masterpiece of 21st century dance' from English National Ballet, Akram Khan’s Giselle will be coming exclusively to Eden Cinemas on the 25th and 29th of April. Recognised as one of the greatest romantic ballets, Giselle has been re-imagined by celebrated choreographer Akram Khan, with Artistic Director and Lead Principal of English National Ballet, Tamara Rojo, dancing the role of Giselle, one of a community of migrant workers cast out of their jobs in a condemned garment factory. His first full length ballet, Khan’s Giselle features set and costume designs from Academy Award-winning designer Tim Yip, known for his work on the hit film Crouching Tiger, Hidden Dragon, and an adaptation of the original Adolphe Adam score by composer Vincenzo Lamagna, orchestrated by Music Director, Gavin Sutherland and performed live by English National Ballet Philharmonic. Giselle also features dramaturgy from Ruth Little and lighting design from Mark Henderson. The ballet has won an Olivier Award, the South Bank Sky Arts Award for Dance, and Akram Khan won the 2017 Critics’ Circle National Dance Award for Best Classical Choreography for Giselle. The production has received rapturous 5-star reviews and was sold out when performed at London's Sadler's Wells. This is the first time an English National Ballet production has been filmed for cinema, extending the reach of the company beyond its existing national and international touring programme.